Last year, Virginia was the victim of the greatest upset in NCAA Tournament history when they became the first-ever No. 1 seed to lose a first-round game to a No. 16 seed, UMBC. Saturday, 379 days after losing to UMBC, Virginia defeated Purdue 80-75 in an overtime epic to win the tournament’s South Regional and advance to the Final Four for the first time since 1984. While the memory of the UMBC defeat will still be an unpleasant one for coach Tony Bennett, his Cavaliers and their fans, Saturday’s victory changes the narrative of that loss. In a bubble, the loss was the worst thing that could have happened to a college basketball team. But in the bigger picture, the loss becomes the beginning of one of the great redemption stories ever seen in sports. This is not to suggest that Virginia’s loss last year was a “good thing” — to do so would disrespect both the accomplishment of UMBC and the Virginia seniors from last year who experienced that heartbreak and haven’t experienced this year’s Final Four run. But now, a year and a program-record 33 wins later, coach Tony Bennett and his team can begin the story of this year’s success with that loss and recall how they overcame the humiliation and noise that came from it, only to come back better and reach the Final Four the following March. A year after going to his knees in despair as time expired against UMBC, senior Kyle Guy finished the win over the Boilermakers on his knees as well — but this time he was overcome with jubilation. Bennett’s Virginia team reaching the Final Four — on the 10th anniversary of his hiring, no less — also helps change the overall narrative around the program. Even before last year’s upset loss, many saw the Cavaliers as a team that played great in the regular season but couldn’t win in the NCAA Tournament. That perception wasn’t completely unfounded. Since Virginia’s run of success began in the 2013-14 season, the team lost in the Sweet 16 in 2014 and the second round in 2015 after a pair of first-place finishes in the ACC. In 2016 the Cavaliers blew a double-digit lead in the final minutes of their Elite Eight game against No. 10-seed Syracuse, before a 2017 second-round loss to Florida. Every loss except the one to Florida came as the higher seed (either a No. 1 or No. 2 seed in each case), and against the Gators the Cavaliers could only muster 39 points. Then came UMBC. Virginia — a program known more than anything else for a staunch defense — allowed 53 second-half points in a 20-point loss to the Retreivers. They weren’t just the first No. 1-seed to lose to a No. 16; they were routed. The narrative about postseason struggles intensified exponentially. After that loss Bennett told his team they had to own it. He said they had no choice but for that loss to be a part of their legacy — it was going to be in the record books no matter how much the team disliked it — and that the best way to respond would be to come back and add a successful 2018-19 campaign to that legacy. And did they ever add to that legacy. This group of Cavaliers — the upperclassman leaders Guy and Ty Jerome, the star forward De’Andre Hunter, the sixth-man-turned-postseason-starter Mamadi Diakite, the big New Zealander Jack Salt, the small but quick Kihei Clark and a solid-though-seldom-used group of reserves — will now become the Virginia players in 35 years to play in the Final Four, and could become the first Cavaliers to win a national championship. After failing to execute in their previous tournament failures, the Cavaliers made the big plays on Saturday night. Guy made five second-half threes en route to a 25-point night, Hunter hit the layup with 28 seconds left in overtime that gave the Cavaliers the lead for good and Clark hit the free throws in the final seconds to ice it. And then there was the biggest play in the game, in the tournament and in Virginia basketball history: Trailing by two in the final seconds, Diakite tipped the rebound of a missed Jerome free throw out past half court, Clark ran it down and frantically passed the ball back to Diakite, who threw up a 15-foot prayer — one which was nothing but net and sent the game to overtime, where Virginia eventually won. These clutch plays helped to ultimately change the outcome of the game and perhaps the tournament. They helped change the perception of an entire program. And they helped change this group of Cavaliers’ tournament legacy, from that of the event’s most notable losers to that of Final Four-bound redeemed regional champions. Louisville men’s basketball coach Rick Pitino was placed on unpaid leave on Wednesday (with the expectation that he will be fired once his contractually-required 10-day notice expires) after the Cardinals program was among several implicated by an FBI investigation into bribery and corruption in college basketball. Pitino is a Hall of Fame coach with great on-court success at multiple stops throughout his career, but that has all come to a very blunt ending. Yet there’s no need to mourn for the legacy Pitino has lost, as his impending termination is the end of a long, winding and, to be frank, disgraceful road that got him here. Yes, Pitino is the only coach to lead two different schools to national championships, winning them in 1996 at Kentucky and 2013 at Louisville. Yes, he has seven Final Four appearances, and is the only coach to take three schools to the Final Four, also doing so at Providence. Yes, he has 12 conference tournament championships (one at Boston University, five at Kentucky, six at Louisville), and been to 21 NCAA Tournaments, including 19 of the last 21 years his team was eligible. Yes, Pitino has 770 collegiate wins, and may have 900 if not for six seasons as an NBA coach with the New York Knicks, who he took to the playoffs twice, and the Boston Celtics. But with the revelation of the scandal that has brought Pitino’s career to a crashing end, real questions exist about Pitino’s on-court accomplishments, as the legitimacy of his players, their amateur status and their reasons for coming to Louisville (or Kentucky, Providence or Boston University) is now under a black cloud of doubt. The FBI alleges that the family of a highly-ranked recruit (the overwhelming consensus is that the player, unnamed in the FBI report, is Louisville commit Brian Bowen) agreed to be paid $100,000 by Adidas executives–who were working in conjunction with a Louisville assistant coach–for the recruit play at Louisville. As part of the agreement, the recruit would represent Adidas when he turned professional. This scandal reaches far beyond Louisville, as 10 individuals, including four Division I assistant coaches, were arrested in the case on Tuesday. But it’s Pitino who has the highest profile of anyone implicated in this case, even as he was not directly named in the FBI report (though he reportedly was listed as “Coach 2”). Pitino was already suspended for five games this coming season as the result of his program’s previous scandal, in which former assistant coach Andre McGee had paid for the services of prostitutes and strippers for players in the team dormitory. Pitino has also admitted to an extramarital sexual encounter in 2003, in which he impregnated his mistress and paid for her abortion. In each previous case, Pitino’s job has seemed bulletproof. He downplayed both his affair and the escorts scandal, and claimed ignorance regarding the escorts. With Pitino’s habitual refusal to accept any responsibility, and the pattern of athletic director Tom Jurich–who was also fired–releasing a passive statement of support (which he’s also done in regards to the football program’s issues), I assumed we would see the same movie this week, and Pitino would be pacing the sidelines of the KFC Yum! Center this winter. Yet this scandal, which figures to bring down more than just Pitino over the coming months, finally ousted a man who could have, and should have, been out of college basketball years ago. From purely an on-the-court perspective, Rick Pitino can legitimately say he has had a good career. But don’t shed a tear for Pitino’s career coming to an end the way it did. He’s done plenty to deserve this. After the first weekend of the NCAA Tournament, the ACC had only one of its nine tournament teams still alive, and some questioned the league’s strength. Two weeks later, the ACC can boast a national champion for the 14th time (the league will claim 18, but Louisville and Syracuse combined for four before they were in the ACC). North Carolina has won nearly half of the ACC’s titles, winning their sixth this year, after they were the best and most consistent team throughout the entire season. The Tar Heels won the regular season title in the nation’s best conference, foreshadowing what they would accomplish in the NCAA Tournament by winning the national title over Gonzaga on Monday. With his third title (2005, ’09, ’17), Roy Williams passes his mentor, the legendary Dean Smith (national champion in 1982, ’93), and joins Mike Krzyzewski as one of two active coaches with three or more championships. At the ACC Tournament, Duke became the first team in tournament history to win four games in four days, beating Notre Dame for the title after previously beating Clemson, Louisville and North Carolina. In the NCAA Tournament, the Blue Devils were stunned in the second round by South Carolina, although they weren’t the only team the Gamecocks upset on their way to the Final Four. After losing their ACC Tournament opener to Duke, the Cardinals lost a back-and-forth second round battle in the NCAA Tournament to Michigan, who was one of the hottest teams in the NCAA field until their eventual loss to Oregon. The postseason performances of the Cardinals did not match the strength of their season overall, although postseason results are often how a season is measured. The Seminoles were a great team, but had some inconsistency, which bit them in a blowout loss to Xavier in the second round of the NCAA Tournament. Despite being arguably Leonard Hamilton’s best team in Tallahassee, the ‘Noles missed an opportunity to have Hamilton’s best March result. The Irish reached the finals of the ACC Tournament for the second time in the last three years, falling to Duke, before surviving a NCAA first round scare against Princeton then losing to West Virginia. Mike Brey has a knack for overachieving teams, and this year was no different–I picked them ninth in the league in November. After a quarterfinal loss to Notre Dame in Brooklyn, the Cavaliers reached the second round of the NCAA Tournament, but scored just 39 points in a 26-point loss to Florida. Virginia’s success under Tony Bennett has come by winning low-scoring defensive struggles, but scoring just 39 in an NCAA Tournament will never get a team where they want to go. This season has to be considered a success for Buzz Williams’ Hokies, who reached their first NCAA Tournament since 2007 and second since 1996. They weren’t the only team knocked out by Wisconsin, as the Badgers also beat top overall seed Villanova in the next round. Danny Manning’s rebuild in Winston-Salem reached the NCAA Tournament a year quicker than many expected. Down the stretch of the season, and in both postseason tournaments, the Deacon defense was an issue; that, along with whether or not First Team All-ACC forward John Collins returns, are the biggest questions heading into next year, as the Deacs should continue improving. The Hurricanes reached the NCAA Tournament for the third time in five years, marking only the second such stretch in school history. Jim Larranaga had tough coaching matchups in the postseason: after beating Jim Boeheim in Brooklyn, the Hurricanes lost to Roy Williams in Brooklyn and Tom Izzo in the NCAA Tournament. An ACC Tournament loss to Pittsburgh nailed the Yellow Jackets’ NCAA coffin shut, but the Yellow Jackets took advantage of their NIT opportunity by reaching the final, where they lost to TCU. This season still has to be considered a success for Josh Pashner in his first season in Atlanta–the team was picked last in the ACC by many, including me. Clemson hung around the NCAA bubble deep into the season despite a mediocre record because of a very difficult schedule. But in the end, the Tigers just didn’t win enough to make The Dance. After losing to eventual ACC champ Duke in Brooklyn, the Tigers were upset by Oakland in their NIT opener, ending their season. The Orange didn’t have a good postseason, losing to Miami in the ACC Tournament, scantly missing the NCAA Tournament, then losing to Ole Miss in the second round of the NIT. And yet, their postseason won’t even be most remembered for those results, but instead for the war of words between Jim Boeheim and the city of Greensboro. C’mon, Jim. After some guy named Chris Stiles picked this veteran team to finish fourth in the ACC, the Panthers were the biggest underachiever in the country this season, winning just four ACC games. But hey, with their first round win over Georgia Tech in the ACC Tournament, they ensured the Yellow Jackets wouldn’t go to the NCAA Tournament either. The Wolfpack also underachieved, with a roster including future NBA lottery pick Dennis Smith. They did something they hadn’t done since 1995, beating Duke at Cameron Indoor Stadium, but after Mark Gottfried was fired Feb. 13, the Wolfpack uneventfully played out the string. Kevin Keatts, coming off back-to-back NCAA bids at UNC Wilmington, will take over in Raliegh. The last several years have been a struggle for the Eagles, so much so that their 2-16 conference record is actually an improvement. However, ending the season on a 15-game losing streak still leaves a bitter taste in their mouths entering the offseason. As the NCAA Tournament enters its second weekend, certain teams always seem to capture the hearts of fans, many of whom are looking for another rooting interest after their own team has been eliminated. This year there are not necessarily any “Cinderella” teams, but there are still a fair share of teams who can be sentimental favorites as the Sweet 16 begins tonight. It’s odd to include a traditional power like Arizona on this list (that’s why they’re an honorable mention), but a potential Wildcats run to the title has its share of storylines, considering the Final Four is in Phoenix, and Arizona is celebrating the 20th anniversary of their last national title in 1997. The sports social media world keeps buzzing over the crazy things Lavar Ball, the father of Bruins point guard Lonzo Ball, has said. I’m all for parents being involved in their kids’ lives and athletic careers, but Lavar Ball is completely over the top, considering at this point he’s making headlines on almost a daily basis. If UCLA loses, maybe he’ll shut up–at least until his other two sons are playing college basketball in the near future. It’s strange to put a team on this list who is a 1-seed, and has participated in every NCAA Tournament since 1999. However, the Bulldogs are still the little brother to fellow 1-seeds North Carolina and Kansas, and many aren’t even favoring the Zags to win the regional, since they may face Arizona in the regional final. To even get there, they face a tough matchup with 4-seed West Virginia in tonight’s regional semifinal. Gonzaga reaching the Final Four would be a feel-good story because they have come close but fallen short in their previous tournament runs. 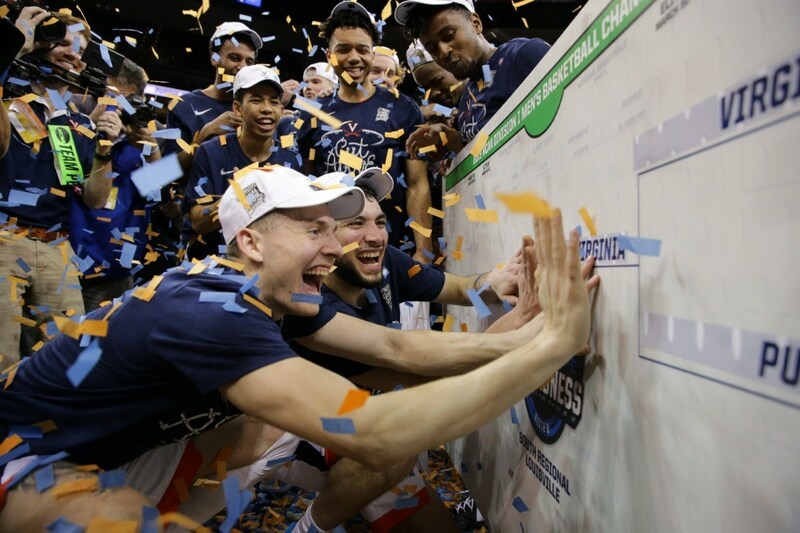 Mark Few has led the Bulldogs to eight Sweet 16 appearances and two Elite Eights (1999, 2015), but have yet to reach the Final Four, despite having one of the most consistent programs in the nation. The Zags play in the West Regional in San Jose, and the Final Four is in Phoenix, should they reach it; both locations should allow their fans to join them. The Bulldogs have been the sentimental favorite before–they were back-to-back national runners-up in 2010-11, losing national finals to Duke and UConn–and now they return to the list seeded higher than either of those years (Butler was a 5-seed in 2010 and an 8-seed in 2011), as they make their first Sweet 16 appearance since the 2011 run. But despite their recent success, the Bulldogs are still far and away the least accomplished team in the South Regional, which also includes North Carolina, who Butler meets Friday night, as well as Kentucky and UCLA. Those three schools have combined for 24 national championships and 54 Final Four appearances. Few expect Butler to make any noise in Memphis, but the Bulldogs program has been in this situation before. The Musketeers are on this list at the lowest-remaining seed. Xavier has reached the Elite Eight twice, in 2004 and 2008, but has lost in the Sweet 16 four times since that 2008 appearance. Xavier, who has been a near-perennial NCAA Tournament team for the last two decades, has had tough luck losing good coaches to jobs at bigger programs: Skip Prosser (Wake Forest), Thad Matta (Ohio State) and Sean Miller (Arizona). Now current Xavier coach Chris Mack will face former coach Miller in the Sweet 16. Miller, who was coach the last time Xavier reached the Elite Eight, left in 2009 to succeed Hall of Famer Lute Olson at Arizona. This will be a tough test for Xavier; the Wildcats are one of the favorites to win it all, and the game is in San Jose, which should give Arizona a crowd advantage. Even if Xavier wins tonight, the Gonzaga-West Virginia winner would be no easier of an opponent on Saturday. On Wednesday, March 8, as the Wolverines were departing Ann Arbor to head to Washington D.C. for the Big Ten Tournament, their team plane (with the team, coaches, family members, band and cheerleaders aboard) skidded off the end of the runway due to high winds. Miraculously, no one was injured in the accident. Michigan flew to Washington early the next morning to play their noon opener in the Big Ten Tournament, where they wore practice uniforms since their game jerseys were on the crashed plane. The Wolverines beat Illinois comfortably that Thursday, before beating Purdue, Minnesota and Wisconsin to remarkably win the conference title. After starting their NCAA Tournament with a 92-91 win over Oklahoma State, the Wolverines upset 2-seed Louisville on Sunday (and became a further sentimental favorite by knocking the scandalous Louisville athletic department out of the field), advancing to their third Sweet 16 in five years. Since the accident, the Wolverines have seemed to play more loosely, and have no doubt played better than before. Tonight, they face an Oregon team that lost its best player, forward Chris Boucher, in the Pac-12 Tournament. Should the Wolverines advance to the Elite Eight, they would either encounter a Big Ten title game rematch against Purdue or a rematch of their classic 2013 comeback win over Kansas in the Sweet 16. Sure, the Michigan program has had tremendous success in the past–the Wolverines have reached five Final Fours, including 2013, and won the 1989 national title–but the story of this team in their run to the Sweet 16 has been incredible. Now, as they face an uphill climb as the lowest seed in the Midwest Regional, the Wolverines will try to continue to play out this movie-like scenario and write their Hollywood ending. Sure, the Gamecocks happen to be a team I pull for, but that’s not why they are at the top of this list. The Gamecocks are a sentimental favorite because of their program’s history (or, really, a lack thereof). This tournament marks just the ninth appearance in the NCAA Tournament for the program, and the first since 2004, after the Gamecocks were snubbed from the field last year. Before last year’s NIT bid, the program had just one winning season since 2006. After a first round win over Marquette–their first NCAA Tournament win in 44 years–the Gamecocks shocked the world and beat Duke 88-81, eliminating one of the biggest favorites to win the national title. Beating Duke is enough by itself to make the Gamecocks a sentimental favorite for some, but especially when the win got South Carolina to the Sweet 16 for the first time since 1973. Now, the Gamecocks face Baylor (you know, that school that turned a blind eye to sexual assaults committed by student-athletes) as they try to reach their first Elite Eight in program history. The East Region, at Madison Square Garden in New York, is wide open: 3-seed Baylor is the top remaining seed, and 4-seed Florida meets 8-seed Wisconsin (who beat 1-seed Villanova) in the other regional semifinal. South Carolina, led by SEC Player of the Year Sindarius Thornwell (21.4 PPG, 7.3 RPG, 2.9 APG), have arguably the best player on any team in the East Region. South Carolina is trying to complete a unique trifecta for its state: Coastal Carolina won the baseball national championship in June and Clemson won the football title in January. Schools from one state have not held all three titles simultaneously since 1975. A month synonymous with the stunning upsets, startling buzzer-beaters, and scintillating battles that make up the NCAA Tournament. March was the goal for 351 teams when practice began in October, and games in November. Just 68 accomplished their goal of making it here, while the dreams of the rest ended in agony and heartbreak. For each it is the consummation of a season’s-long effort, whether they are here for the 57th time, like Kentucky, or the first, like Northern Kentucky. For the fortunate field of 68 who accomplished their goal of being alive come March, their goal now shifts to still being alive come April, and becoming one of the four to earn a fateful trip to Phoenix. The journey there will require skill, determination, and perseverance in each individual contest to achieve victory, as the number of those still alive quickly dwindles. The goal for each contest is to survive and advance. The goal for this thrilling three weeks is to be the only one still surviving and claim the crown of a championship. As the first round of the NCAA Tournament gets underway, everyone tries to pick the big upset or two, in an attempt to say “I called it!” if it actually happens. But in this year’s bracket, there are multiple teams with double-digit seeds who have a realistic chance at winning not just one, but two games, and advancing to the Sweet 16. These Cinderellas haven’t just been invited to The Big Dance; they may still be on the dance floor when the tournament enters its second weekend. While I did not pick all of these teams in my bracket (in fact, I only picked one to advance to the Sweet 16), they are the teams that have the best opportunity to make a run through the first two rounds, based on both matchups and their own abilities. Marquette’s draw is tough, against South Carolina in the Palmetto State, then potentially against Duke, but consider this: South Carolina has lost five of seven and hasn’t won a tournament game since 1973, while Golden Eagles coach Steve Wojciechowski was an assistant under Duke’s Mike Krzyzewski, and teams led by Coach K proteges tend to play well against Duke. I know they’re a 14-seed, but this wouldn’t be fun without one really low seed on the list. In 2013, FGCU captured the nation’s hearts with an improbable run to the Sweet 16, upsetting 2-seed Georgetown and 7-seed San Diego State, advancing further than any 15-seed in tournament history. Here’s the thing: this team is actually better. The 2013 Eagles actually didn’t win the Atlantic Sun regular season title, but won the league tournament to reach the NCAA Tournament. This year, FGCU did win the regular season title with a 12-2 league record, and the team is 19-2 since Dec. 17, including seven straight wins. The 2013 team, nicknamed “Dunk City,” had 148 dunks, but this year’s edition has 157, while this year’s team also has two more wins entering the tournament than the 2013 Eagles did. They have their work cut out for them against Florida State, the 3-seed in the West Region, but while the Seminoles have had a great year with some really big wins, they also have been slightly inconsistent. The ‘Noles are an impressive 7-3 against the Top 25, but have four losses against teams that missed the NCAA Tournament. The game is in Orlando, so both teams will have a large fan turnout. Looking ahead to a potential second round matchup, the Florida State-FGCU victor will face either 6-seed Maryland or 11-seed Xavier, and either will be beatable. Maryland enters the tournament having lost four of their last six, while Xavier lost six straight from Feb. 11 to Mar. 1 after point guard Edmond Sumner was lost for the season with an injury. The hottest team no one is talking about entering the tournament is Vermont, who has the nation’s longest winning streak at 21 games. The champions of the America East Conference, the Catamounts have not lost a game since Dec. 21, and three of their five losses on the season came to fellow tournament teams. Purdue is the regular season champion of the Big Ten, although this has been a “down year” for the historically strong conference, and the Boilermakers were one-and-done in the Big Ten Tournament. Purdue also has a knack for inability to finish games in the tournament; the last two years they have blown big leads late to lose in overtime in the first round. For a team to stop Purdue (34th in nation with 80.1 PPG), they need a good defense, and Vermont has it (61.6 PPG allowed is 11th nationally). One would imagine Vermont will have to overcome adversity to beat a team like Purdue, but that will be no problem for coach John Becker–before Vermont, he coached at Galludet, the nation’s leading university for the deaf. 5-seed Iowa State, the Big 12 Tournament champions, are a possible matchup for Vermont in the second round, although a potential defeat of the Cyclones by 12-seed Nevada is a trendy first round upset pick; such an upset would set up a second round matchup of two double-digit seeds should Vermont beat Purdue. The regular season and tournament champions of the Colonial Athletic Association enter the NCAA Tournament having won 18 of their last 21. Last year as a 13-seed, the Seahawks played 4-seed Duke close, losing 93-85 after leading at halftime, and this year they will play 5-seed Virginia in the first round. When people think Virginia, they think defense, and rightfully so: the Cavaliers allow a national-best 55.6 PPG. However, the Seahawks have the offense to match, ranking 10th nationally at 85.2 PPG. Devontae Cacok is shooting 79.9 percent from the field, a mark that is over five points better than the existing NCAA single-season record. Virginia has, at least theoretically, underachieved in the last three tournaments as a 1- or 2-seed, and they have also lost their last three tournament games when they were a 5-seed or lower. The Virginia-UNCW game will tip at 12:40 pm ET this afternoon, and early afternoon games have a knack for producing upsets. The winner of Virginia-UNCW will face the winner of Florida-East Tennessee State in the second round. While 4-seed Florida would be a tough matchup for the Seahawks (as they would be for anyone else in the field), it is within the realm of possibility that East Tennessee State could upset the Gators, as the Buccaneers are dangerous with four senior starters. Either way, UNC Wilmington has the tools to potentially compete with either team and threaten to make the Sweet 16. Last year, Middle Tennessee State pulled off arguably the biggest upset in NCAA Tournament history, shocking 2-seed Michigan State 90-81. Even after three players from that team graduated, this year’s Blue Raiders are even better, winning the C-USA regular season title (last year’s team did not), then backing it up with the league tournament title. The Blue Raiders have won 20 of their last 21, led by four seniors and three players averaging at least 14.5 PPG (JaCorey Williams, Giddy Potts, Reggie Upshaw). The Blue Raiders rank 11th nationally in field goal percentage; their first round opponent of Minnesota ranks 213th. Minnesota is 24-9, but has lost two of their last three, and a five-game losing streak in January is a dark spot on their resume. The Golden Gophers are coached by Richard Pitino, the son of Louisville coach Rick Pitino (the pair are becoming the first father-son duo to coach in the same NCAA Tournament, although they cannot meet until the Final Four). Minnesota is over-seeded, at least in my opinion, while Middle Tennessee State is under-seeded; as a result, even though this is a 5-vs-12 game as seedings go, ESPN’s BPI gives Middle Tennessee State a 46 percent chance to win. That’s the fourth highest percentage for any double-digit seed, and by far the highest for any team seeded 12 or worse. As far as a potential second round matchup, the Minnesota-MTSU winner will face the winner of Butler and Winthrop. Butler is a heavy favorite, and is responsible for two of Villanova’s three losses, but have shown they are beatable with a trio of “bad losses.” Winthrop is a heavy underdog, but may have the best player on the floor on Thursday in Keon Johnson, a 5-foot-7 guard who scores 22.5 PPG. Rhode Island enters their first NCAA appearance in 18 years with wins in eight straight games and 12 of their last 14, having played their way onto the tournament bubble, then off of it by winning the Atlantic-10 Tournament (and automatic NCAA bid). The Rams are looking to repeat the success of the last time they were an 11-seed: in 1988, they went to the Sweet 16. The Rams’ first round opponent is Creighton. The Blue Jays started the season hot, but are just 8-7 since losing guard Maurice Watson Jr. for the year, with half of those wins coming against the bottom three teams in the Big East. An intriguing individual matchup to watch is on the inside, between Creighton’s Justin Patton and Rhode Island’s Hassan Martin. Patton has a decided height advantage (7-foot to 6-foot-7), but Martin plays bigger than his height and has led the A-10 in blocked shots four straight seasons. Creighton is a 61 percent favorite in ESPN’s BPI, and just a 2-point betting favorite, despite the 6-vs-11 seeding of the matchup. In the second round, the Rams could potentially meet Oregon or Iona. Oregon is without post-man Chris Boucher, who blew his knee in the Pac-12 Tournament and dealt a big blow to Oregon’s chances at a deep run. The Ducks won the first NCAA Tournament in 1939, but haven’t been back to the Final Four since. 14-seed Iona is capable of upsetting Oregon if leading scorer Jordan Washington (17.9 PPG) can stay on the floor; he averages just 21.7 minutes per game. Whether Oregon or Iona wins, the potential second-round matchup would play to Rhode Island’s favor. Duke used a clutch, efficient and balanced offensive attack to beat Notre Dame, 75-69, and win their first ACC Tournament since 2011 and their 20th in program history, extending a tournament record. The Blue Devils shot a season-high 61 percent from the floor (31-51), including hot shooting performances from Jayson Tatum (7-11), Frank Jackson (4-6) and Amile Jefferson (7-8). Defensively, Duke held Notre Dame to 40 percent (27-67), and 24 percent from three (6-25). Tatum led Duke with 19 points and eight rebounds, with Luke Kennard adding 16 and Jefferson netting 14. Grayson Allen scored 10 points with four assists. Notre Dame’s Bonzie Colson, who played much of the second half favoring an ankle injury, led all players with 29 points and nine rebounds. V.J. Beachem scored 15 for the Irish and Matt Farrell scored 13 with seven assists. But despite Colson’s MVP-caliber performance, Duke outscored Notre Dame 44-32 in the paint and blocked the Irish five times. Duke dominated the opening half, leading as big as 31-22, although an 8-0 Notre Dame run in the final two minutes pulled the Irish within two before Allen beat the buzzer to give Duke a 38-34 halftime edge. Notre Dame came out firing in the second half to take a 56-48 lead with 11:35 left. Duke responded with a 10-1 run to take a 58-57 lead with 7:08 remaining, and after a back-and-forth stretch over the next few minutes, Colson tied the game at 65-65 on a three with 2:27 left. Duke answered, taking the lead on a free throw by Tatum, adding to the lead on Tatum’s layup on the next possession, the stretching the lead to 71-67 with 0:48 left on a clutch three by Matt Jones, his only made shot of the game. After a Beachem dunk got the Irish within two, a Tatum dunk made it 73-69, before single free throws by Tatum and Kennard put the game away. The win for Duke avenged losses in the last two ACC Tournaments to Notre Dame, led by former Duke assistant Mike Brey. Duke becomes the first team to win four games in four days to win the ACC Tournament, and is the first 5-seed to ever win the event. Their 20th title is the second most in any conference tournament, behind only Kentucky (29 SEC titles). The title is the 14th in the ACC Tournament for coach Mike Krzyzewski, passing Dean Smith for the most all-time in the same tournament in which he passed Smith for the most wins in ACC Tournament play; Krzyzewski is now a remarkable 61-22 in ACC Tournament play. Legendary Duke broadcaster Bob Harris, who is in his 41st season and is retiring at season’s end, called his 17th ACC Tournament championship by the Blue Devils. Duke (27-8) now awaits their NCAA Tournament fate as the ACC’s automatic qualifier, and some pundits suggest their ACC title may be enough to earn the Blue Devils a 1-seed, although a 2-seed is more likely. The Blue Devils will almost certainly begin their tournament run in Greenville, S.C. Notre Dame (25-9) is also a lock for an NCAA at-large berth, with the field and pairings set to be announced Sunday at 5:30 p.m. It would appear that Harry Giles’s confidence/impact has stretched into tonight as well. After the NC State loss, it seemed like Duke had a Jayson Tatum problem. Over the last month, the ACC has had a Jayson Tatum problem. Both explosive, skilled offensive teams. Difference: Devils defending much better. Irish can’t slow Duke. This is the first test of Duke’s legs. Krzyzewski called a time out with 2:15 left in the half to rest his players and slow the pace. Maybe. Notre Dame will survive the first half. Duke had chances to make a run but slowed as the half went on. Duke’s back to doing a horrible job of closing out the half. The last 90 seconds was huge against Louisville and UNC. Awful tonight. Plenty of reasons Notre Dame has had success against Duke the last few years. One is sharing the Blue Devils’ “hard-to-kill” trait. Halftime: Duke 38, Notre Dame 34. Devils 55.6%, Irish 39.4%. Notre Dame is so synonymous with football we overlook the hoops despite how talented they are. This is a good team and they’re fun to watch. Mike Brey’s teams have always excelled at defending without fouling. Not easy. Louisville and UNC lost composure after calls went against them, Duke fed off it. Notre Dame? They’re chill. Four games, four days, no bench. Time to dig deep. Krzyzewswki in contol of this game now. Brey chasing again. Duke’s getting penetration and outlets. Notre Dame out of synch. 63-62.
Who has more left in tank?! SWEATING IN 22 DEGREE BROOKLYN. THIS IS #ACC BASKETBALL. Bonzie Colson still deserves Tournament MVP. Period. Coach K says there should have been co-MVPs. Said Luke agrees because Tatum’s block and coast-to coast dunk was a huge sequence.